Waiting for the train in Lamy, Glorieta Pass, Crossing the Mighty Mississippi, Chicago Union Station. At the conclusion of our trip, we had planned to fly home to Chicago from Albuquerque, but backed out when the airline moved our departure time earlier by three hours, cutting our time in Santa Fe significantly. With no good alternative flights and to add a new experience, we booked travel on Amtrak’s Southwest Chief from Lamy, NM to Chicago. The reasonably priced tickets included a “roomette” in a sleeper car, three meals and constantly changing views over the course of the 26-hour ride. What it lacks in speed, it makes up in charm. 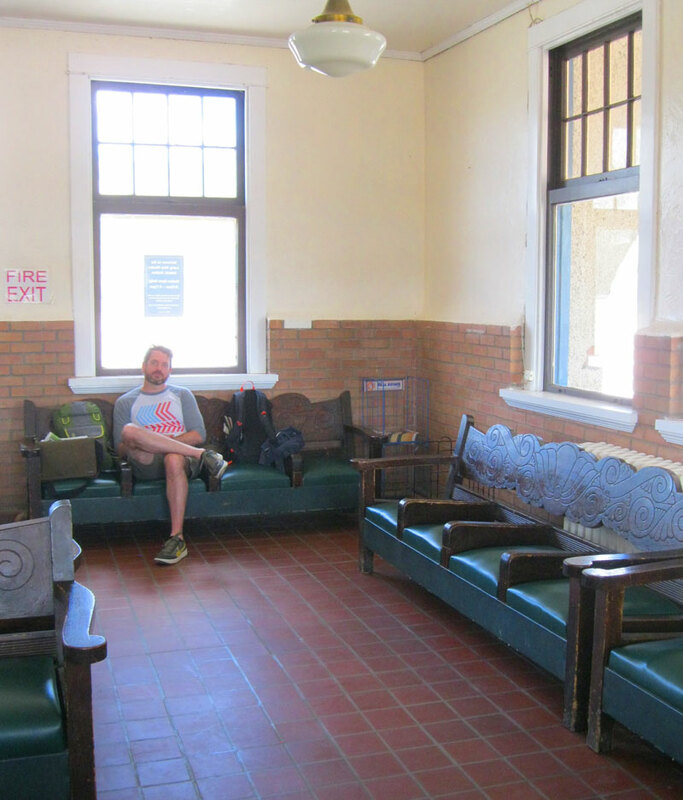 Waiting for our delayed train in Lamy, New Mexico. Things didn’t get off to a great start. While hanging out in Santa Fe Saturday morning, we received text messages from Amtrak reporting the train would be an hour late … then two hours … then two and a half hours. We actually initially didn’t mind the delay since it meant getting to spend more time with friends at The House of Eternal Return, but it does point out some of the problems with our ancient train infrastructure. We delayed our ride to the Lamy station (the closest to Santa Fe) but still spent nearly two more hours waiting at the desolate outpost for our train. Finally it appeared from around a bend, the sleek Amtrak engines being pulled by a chunky BNSF freight locomotive due to engine failure. Our scheduled 1:17 departure had become 4:45. When our car rolled up to the platform, we were greeted by our attendant, Jesús, who already knew our names and immediately prepared our accommodations in roomette 3. Despite the delay, we were impressed by the personal service. The Roomette is a great value for two people. It has two reasonably comfortable seats that face each other with a huge window running the full length of the cabin. A sliding door separates the room from the hallway and curtains can provide additional privacy. Roomettes don’t have a private bathroom like the full cabins, but we found the four bathrooms in each sleeper car more than adequate, never waiting to use the clean facilities. There’s even a shower available if you’d like. The Southwest Chief’s Superliner cars are double-decker, with the majority of the cabins and amenities on the upper levels. Ahead of us was the crew car and behind was another first class sleeper car like ours, after which came the dining car, followed by the observation lounge/bar car. The end of the train has a few coach seating cars, which would be fine for a shorter ride, but we’d only recommend doing overnight routes with the comfort of beds. Rounding a corner in New Mexico with the engines visible ahead of us. Shortly after boarding, Jesús came around to ask what time we would like dinner and gave us a ticket for the selected time. During dinner service, announcements are made calling passengers to the dining car at their reserved hour. When called, we headed back and were seated by friendly staff. The servers ask that pairs sit side by side, so at busy times you might get seated with some new friends. The dining car offers a nice menu plus daily specials. Wine is sold by the half bottle, so naturally we ordered two. During that first dinner service, we were almost giddy with excitement. It’s such a treat to have a full-service meal while traveling the countryside at 70 miles per hour with an ever-changing view. It’s a total contrast to suffering through airline meals with plastic utensils and no elbow room. Since all meals are included with the cost of a first class ticket, we only had to pay for alcoholic beverages and tip (we tipped based on what the cost would have been if the meals weren’t included). After dinner we decided to spend the remaining daylight in the observation lounge. Beers purchased from the lower level snack bar and views out the floor-to-ceiling windows combined with lounge chairs made it about the most relaxing travel experience possible. Sunset over New Mexico viewed from the Observation Lounge. Moving along in New Mexico, the Las Vegas stop offers a glimpse of a formerly luxurious Harvey House hotel that has since fallen into disrepair along the tracks. Unfortunately because of our delayed departure, the sun set before we arrived in Raton, which meant it was already dark during one of the most scenic areas of the Southwest Chief route. Here, the tracks head up to an elevation of 7,835 feet at Raton Pass and cross into Colorado in a tunnel. Around Trinidad, we decided to go back to our roomette. Jesús stopped by to ask if we’d like our room prepared for night and sent us to wait in an empty cabin while he turned the beds down. Returning to roomette 3 we found the seats folded together into a bed and an upper bunk swiveled down from the ceiling. It’s an impressively space-efficient layout, though obviously less comfortable than the average hotel bed. Carrying an extra pillow and a blanket would be a good idea for additional comfort. Getting to the upper bed requires some climbing skill and flexibility. Once situated, we found it a bit difficult to sleep. The constant motion of the train rocking on the tracks sounds like it might be soothing, but it’s a bit disorienting in reality. There’s an odd sense of motion without a clear sense of direction while lying down, I kept forgetting which direction my body was traveling. Also, a few times just as I was about to drift off, a larger side-to-side motion would startle me into thinking I’d be thrown off the bunk. Noise sensitive people might be bothered by the frequent honking for railroad crossings. Eventually we both managed to get some sleep, and it probably gets better the more accustomed you get to overnight train travel. I definitely found it easier to sleep on a train than in a plane, although on a plane you end up on a different continent, not just in the next state. Making our way to breakfast. We awoke around 7:00am in Newton, Kansas, still running nearly four hours behind schedule. After a week in the dry southwest, it was a welcome sight to see some Midwestern spring greenness out the window and feel some moisture in the air. Free coffee and juice is available in the center of the hallway in each car in the morning. 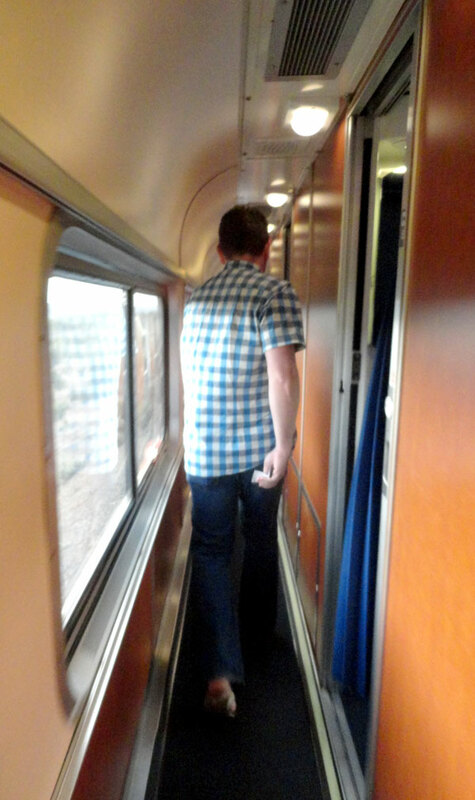 We changed clothes and freshened up in the bathrooms before heading to breakfast in the dining car. Breakfast is first come, first served, but we were seated immediately. The food was also good quality and we were still impressed by the view of the prairie passing by. Around 10:30am, we passed through Kansas City, stopping at the beautiful downtown Union Station. 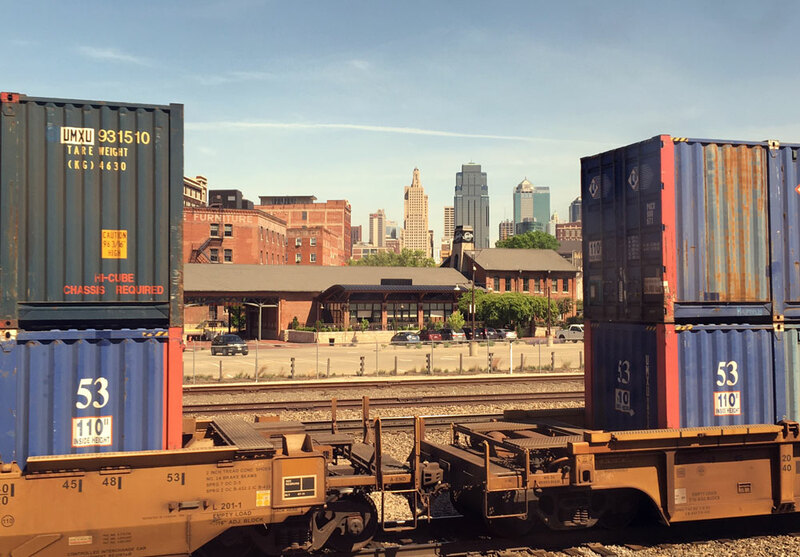 This is one of the longer, 20-minute stops that allows riders to get off the train for a few minutes, we grabbed some fresh air before re-boarding and crossing northern Missouri. Downtown Kansas City viewed from the tracks at Union Station. It’s interesting to see the different view from railroad tracks compared to highways. There are no billboards or signs, just clearer views of nature. It’s a different view of towns too, passing by backyards and industrial areas instead of main streets. We also noticed a lot of people set up along the tracks with cameras on tripods photographing our train as we sped by, proof that train appeal runs deep. We briefly entered the southeastern tail of Iowa before crossing the mighty Mississippi on an impressive double-decker swing span bridge at Fort Madison. Seeing the giant river was a major contrast to the dryness of the southwest, the Rio Grande looks like a tiny trickle in comparison. We spent the last few hours in Illinois mostly reading in our room and looking forward to getting home. We rolled into Chicago Union Station 3.5 hours late, but happy we’d experienced a different way to travel. 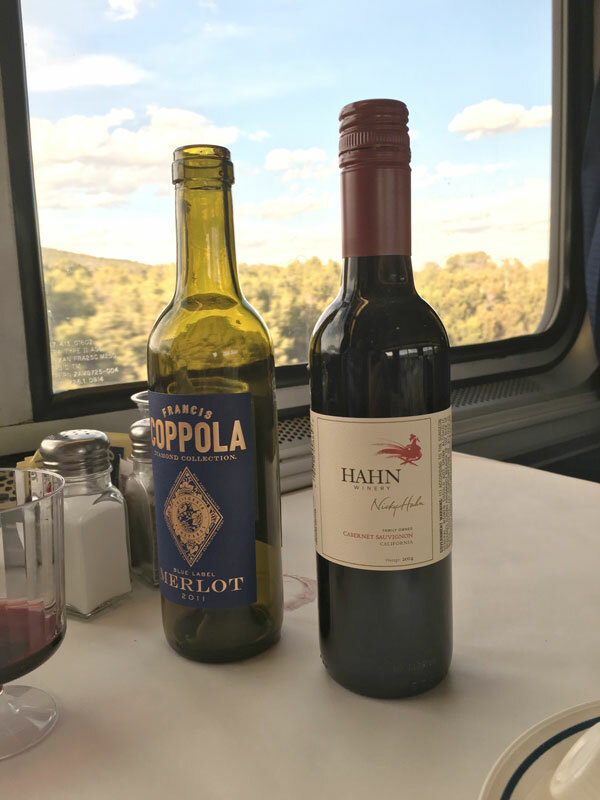 While Amtrak’s routes might not have the speed of Europe’s high speed rail systems, they definitely have the charm of old-school train travel and we loved it. The station’s Great Hall looked as big as Carlsbad Caverns, and out on the street, we looked up at the Sears Tower and imagined the walls of Santa Elena Canyon. The peaks of the skyline from Lake Shore Drive reminded us of the Guadalupe Mountains. We were physically home, but not quite there mentally, as it should be after any good trip. This entry was posted in Travelogues and tagged Amtrak, Amtrak Roomette, Amtrak Sleeper Car, Chicago Union Station, Lamy New Mexico, Southwest Chief, Southwest Chief Route. Bookmark the permalink.